Mission Improbable? It doesn’t take Ed Miliband in a leadership debate to give a ‘hell yeah’ to that question. Fast & Furious 7’s not just Ludicris, but ridiculous too. It would be impossible to approach the seventh instalment of the Fast & Furious franchise without prefacing the review with mention on the shadow cast by the loss of Paul Walker. Killed in a car crash at the age of 40 in November 2013, there is no escaping the poignancy that hangs heavy over this outing. No matter how much this feature attempts to dazzle and daze – which, it does on both counts – this is Paul’s epitaph; it is his cinematic goodbye kiss. Director James Wan, the go-to guy for the horror genre in the modern era, has sculpted a mightily impressive first action film. He fills the screen with enough riotous bombast to satisfy the demands of the franchise, but he also steers his pumped-up, testosterone-heavy flick towards some reminiscence on the tragic, premature loss of Walker come the close. This shows a welcome measure of good judgement. It would take a stern, stifled soul not to be moved by the extended clip montage sequence tracing the years of the Vin Diesel/Paul Walker relationship. It is a touching finale, no matter how unsubtle. 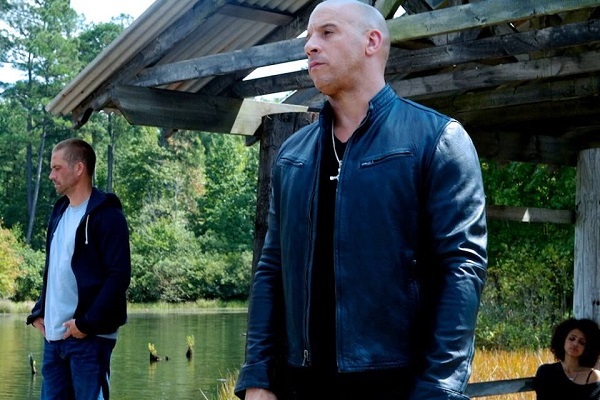 Vin Diesel returns as Dominic Toretto, as does Michelle Rodriguez as Letty. In fact, all the gang are present. In terms of new talent, Jason Statham, undertakes the bad guy role. He plays Deckard Shaw, a black ops British rogue agent, who uses his wiles and skills with weaponry to mark himself out as a delectable foe, and one seeking revenge for the death of his brother, Owen Shaw. Matters expand when Toretto’s crew are enlisted by Kurt Russell’s Mr Nobody to secure a piece of advanced surveillance tech devised by the mysterious ‘Ramsey’. Once that is obtained, promises are made for the troupe to eradicate Shaw. British actress Nathalie Emmanuel does her best with a compromised role; she is expected to be both the brains and the beauty, yet she is not credited in the narrative with an adequate opportunity to evidence the former. 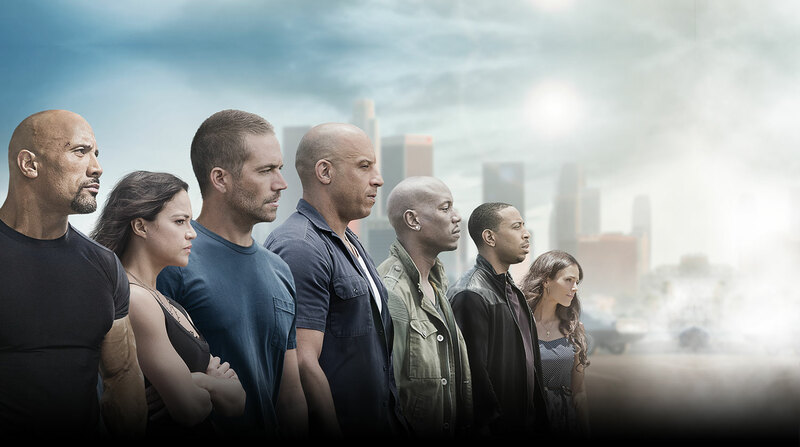 F&F7 contains plenty of fight scenes that thrill; chiming with the sort of frenetic, close combat camera tracking shots synonymous with Asian cinema, and the film as a whole is injected with enough tongue-in-cheek humour to show up the try-hard purveyors of golden age action movie nostalgia, such as The Expendables series, for the turkeys that they are. Elsewhere, and in other news, who would have thought that one of the Fast & Furious films would be a litmus reading of America’s coming-to-terms with the events of 9/11? It is as plain as day that a scene two-thirds through depicting vehicles smashing into high rise buildings would have been rejected outright upon first suggestion only ten years ago. In the event it had been shot, it would certainly have been left on the cutting room floor. It is a curious sign of the healing process that it stands tall and proud here. To seek depth and rationale from within the candy coated violence and globetrotting travails of these films though is to seek substance in an air tight empty container. It is a futile exercise. This is not Synechdoche, New York. It’s not Robocop either. Audiences flock to these films for a hyper-kinetic, hyper-realistic viewing experience. They demand that their senses are engaged. In a tacit exchange, they are more than willing to suspend their disbelief. On these terms, Fast & Furious 7 delivers. How else could you forgive the sight of sports cars parachuting out of an aircraft? It is predominately a teenage boy’s fantasy; like Top Gear on a fizzy drink-addled sugar rush. Style edges the content, and the indestructability of these characters are so hilariously unlikely that they make the Decepticons look like ants bearing the brunt of a heavy boot. For this reason, emotional engagement is a tough ask – there is never any sense of genuine peril. It is a sad, depressing irony that the same didn’t extend to the likes of Paul Walker in real life. As it is, he goes out guns blazing, high-fiving and high-revving. The film itself is overlong and the story runs out of fuel at about the mid-point, but the ride remains dizzying and wild to the end. As a defiant and untimely farewell, Walker, and us, wouldn’t have had it any other way. Fast & Furious 7 is in cinemas from 3rd April 2015. This entry was posted on 01/04/2015 by toomuchnoiseblog in Reviews and tagged action, cars, Cinema, dwayne johnson, fast, fast and furious 7, Film, Franchise, furious, Greg Wetherall, james wan, ludicris, michelle rodriguez, movie, nathalie emmanuel, paul walker, racing, Review, vin diesel.